The past few weeks have been hectic, and I seem to have a few things on the go – whew! I’ve been out to Oregon to look at material for the MFA project, and will be updating that thread soon enough. I’ve been deep into gate design these past 10 days. I also work with the Boston Children’s Museum, which has a complete 100+ year-old Japanese merchant’s house, or machi-ya, installed within. 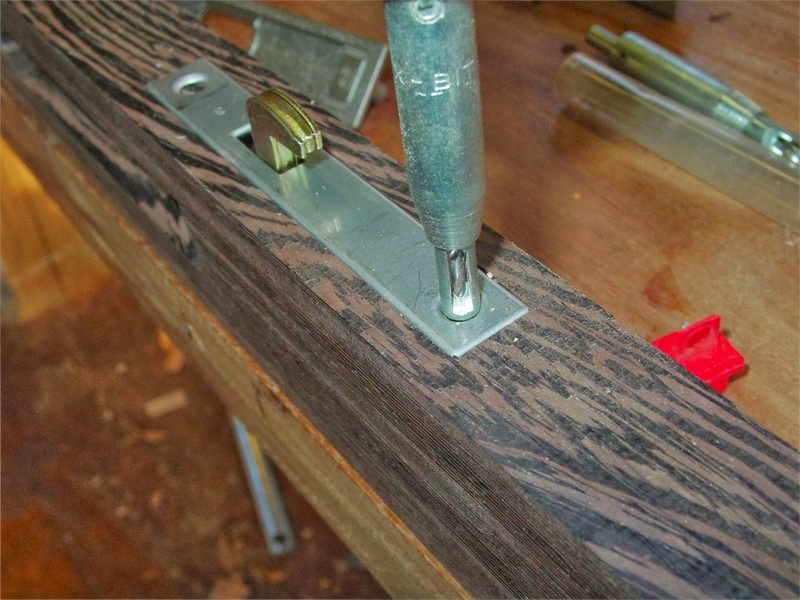 Regular blog readers may recall a series from a few years back where I constructed a replacement hinged bench, battari-shōgi (⇐ link) on a sawhorse in my kitchen. Ah the good old days! Just as with that hinged bench, the front door of the house takes some extraordinary wear and tear given the conditions of the installation, which sees hundreds of young and excited children descend upon the house daily. Recently the door lock completely broke and the Museum asked me to effect repairs. 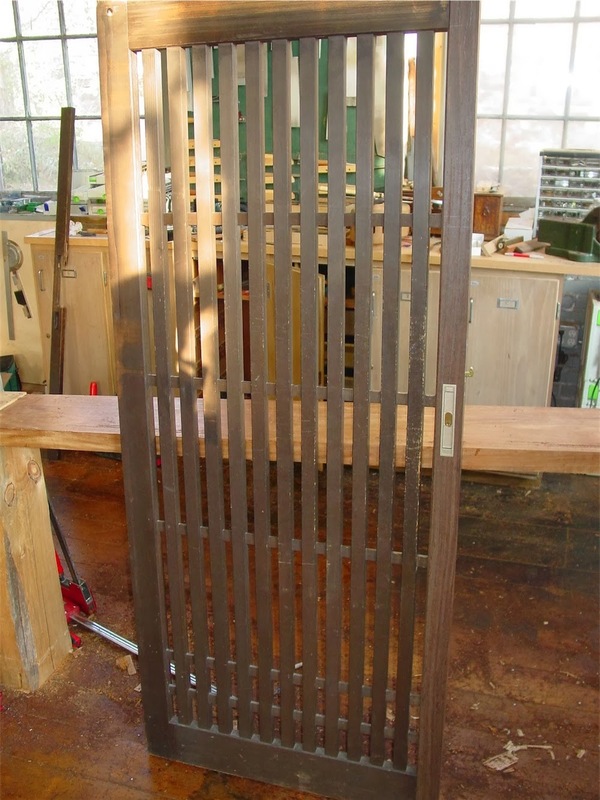 As with the battari-shōgi, I am choosing to replace the door’s stile, which was originally made in a softwood, and stained dark brown, with wenge. Wenge, after rubbing down with finishing oil, looks pretty close to the stained pine, however it is many times tougher. It’s a pragmatic solution to an unusual situation. The replacement wenge stile lays atop the door, and has already been mortised for the multitude of tenons in various sizes. Both top and bottom rails have a mitered return on the front face only. With the stile looking like it would fit on to the rest of the door, I turned my attention to the door lock. 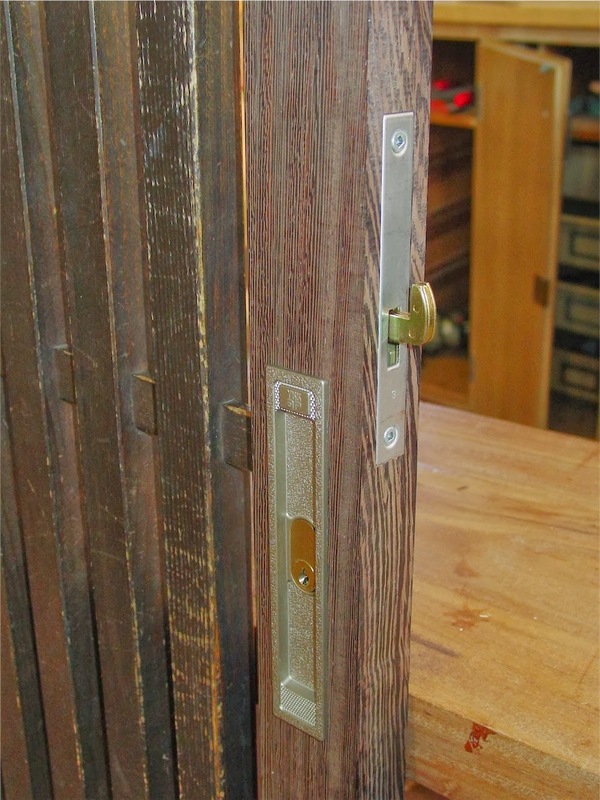 The Museum’s door had been fitted with a door lock which is actually intended for use within a hollow core aluminum sliding door, which happens to be the most common sort of sliding door you will come across in Japan. Curiously, I wasn’t even able to track down a replacement lock which was intended for solid wood doors. Not even a store specializing in temple building accoutrement and minka restoration hardware could be of help. In the end, I had to source another door lock intended to fit an aluminum door. Seems to be the only game in town. I was a little apprehensive about fitting such a lock, as the one which had been fitted originally to the door had been put in fairly crudely. They had cut out most of the stile’s cross section, leaving just a 15mm strip of material left, and then had glued in patch pieces around the lock. Not the most workmanlike job I have come across, and I worried I might have no choice but to do something similar. After I received the new lock, which was a bit smaller than the one originally fitted, I made a test stile piece out of teak to see if I could fit the lock without hacking to door stile to bits. That test went well, so I felt I could move ahead with some optimism. I fitted Robertson (square drive) screws, as I prefer these (and Torx-head screws, though these are less conveniently found at the local hardware store!). All that is left cut-out wise is to cut a couple of scallops on the stile to act as pulls. I should be able to jig up my groover to do this tomorrow. Then a finish planing and chamfering and some oiling, and I’m planning to put on teak oil, which doesn’t build up a sheen as it has little to no varnish mixed in. Then I can glue the new stile up, and trim the ends of the stile to the line. Should be done tomorrow. All for today. Thanks for your visit! BCM Maker Faire post is the next related. I get excited seeing those mortises and tenons. (I know I'm strange, but if I see one more pocket-hole joined piece I will scream). Not many people could make a new piece to fit like you did! This doesn't look like your shop, at least the one I visited. Great work. I guess having a few more tools hanging on the wall tends to transform the look a bit eh? More change to the space coming next week as I take delivery of a new (used) machine. Next time you're in the area or passing by, please drop in and say hello. It was good to see you last time. Nice work & interesting project Chris. Any concern about splinters with the Wenge? good to hear from you. I have concern about splinters from Wenge when working the material, however once the stile's surfaces are finish planed, camfered, and oiled, I'm not worried about it. That bench I made at the merchant's house a few years ago has a wenge frame and after many thousands of people have sat upon it, so far, next to no wear and tear on the wenge. The door receives less wear and tear than the bench, so I'm confident about it being safe to handle for the long term. Thanks Chris, that's good to know. I have some Wenge I want to use for a door on a small wall hung cabinet. other than the splinters, which are to be avoided, I have found wenge to be a stable material in projects where I have worked with it. I'm sure you will come up with a nice cabinet. In this project, the supplier-chosen stick of wenge I received had a significant lengthwise bow in it. After jointing and re-sawing, it sprang a bit, and my plans to have a spare stile on hand brought to a crashing end. I was only just able to eke the required stile dimensions out of the stick, after two more rounds of jointing and planing. Obviously, I might have chosen a better stick had I picked from the pile at the suppliers, but a drive to that particular supplier requires 4.5 hours… So, I have to rely upon his judgment, and in this case, well, he didn't pick a great piece for me. Lesson learned – buying wood from afar can be a crap shoot, and now I will choose the materials on a first hand basis if at all possible. BTW, if you haven't worked with any yet, I can say that wenge is a tough, handsome material that is interesting/challenging in certain respects to work. I find it pretty tough to cleanly chisel or pare on end grain, and in sawing and planing like a combination of soft cedar mixed with 'steel' in quality. This can make hand-ripping a cut tricky I have found as the blade easily wanders in the soft bits of wood. Plusses are that it's not difficult to work with a router or other powered machinery, and doesn't seem to have abrasive silicates present, so tool wear is not too bad. I resort a lot to a 60˚ hand plane – maybe a lower-angled one would work just as well, but not too much lower, say 55˚(?). My goal is to prepare a surface clean, flat and tear-out free. With this in mind, I obtain a surface in which the stone like portions are reasonably glassy surfaces, but the cut on the really soft bits remains a hair fuzzy. If you could only cut the soft bits separately somehow, maybe a 25˚ plane would cut cleanly. After planing, I apply the teak oil, and rub it in with fine sandpaper on a block. After letting it soak in a while, wipe it off and leave it to dry. One more coat or two wiped on, leaving a day between coats. Not much builds up really. I like it. The finished piece should be a good match to the existing stained pine door members. I aim for a sleek surface when the work is done, one that feels good to the hand (as it is handled often) – and done in a material that wears much more hardily than what was there before. The door, mind you, has other issues that need addressing, but the budget doesn't allow for that at this time. I'll repair a few anyhow. When the oil goes on the Wenge, the balsa like parts of the wood seem to absorb more than the stone-like portions, and the striated look you see in unfinished Wenge becomes muted and the wood more homogenous in color. That's the plan at least as far as it goes with finishing. Thanks for the info Chris! I've only used Wenge for Nakashima style butterflies, accents etc. It's such a nice looking wood and I'm looking forward to using for more than accents. that my the above mundane mortise work should now be seen as something on the unusual side in terms of what one encounters is too bad. 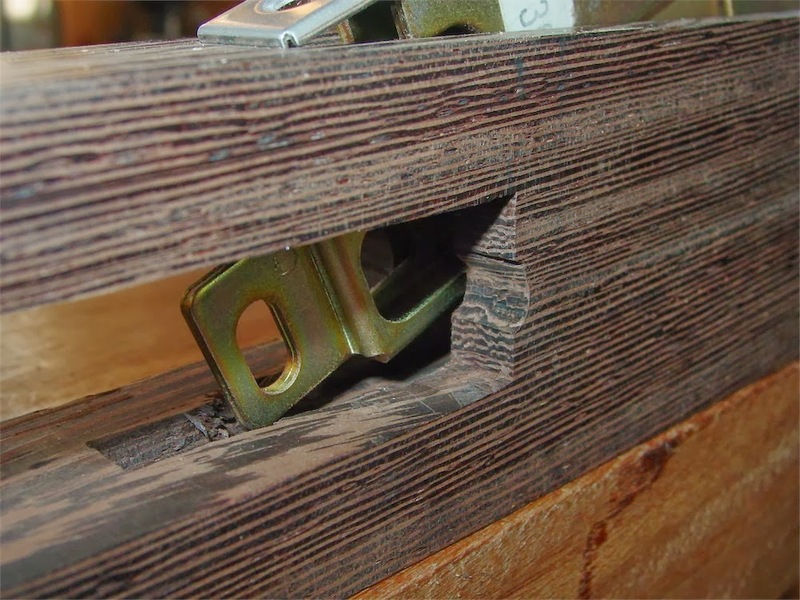 Double and quadruple tenons are by no means the most commonly-encountered joints in old doors in general, and I think they were used in western joinery as well on some limited basis at one point. I think such sliding door frame joints are fairly standard on medium and larger door frames in Japanese carpentry work. Have no fear, there are no plans to embrace pocket-hole joinery, biscuits, or dowels at any point. I have plenty to occupy and challenge me in terms of joinery work. God bless the koshi-do! Nice work, Chris. I find the mortice the weakest part of the joint, so multiple tenons mean multiple (smaller) mortices and an increase in strength. Those fellows were clever. good to hear from you. Although most 19th century western joinery books will state that “the simplest form of the joint is best”, the unstated reason for this assertion is one thing: economy. I've always maintained that, providing the cut out is done cleanly, it is an advantage to increase surface area within a joint, whether seeking mechanical contact or available glue surface. 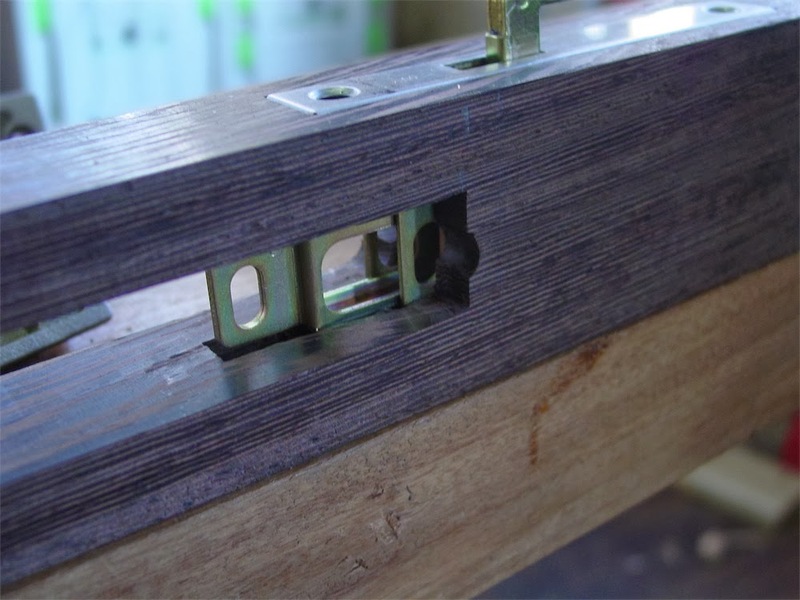 In a joint such as the quad tenon in the rail shown above, which can be considered a development from the twin tenon (also seen in western door joinery), having twice as many tenons doubles the available glue surface. Of course, limitations can be reached with smaller size sticks being joined up, and going to, say, 6 tenons reaches a point of diminishing returns and adds cut out difficulties when mortises get smaller than 1/4″ in width. 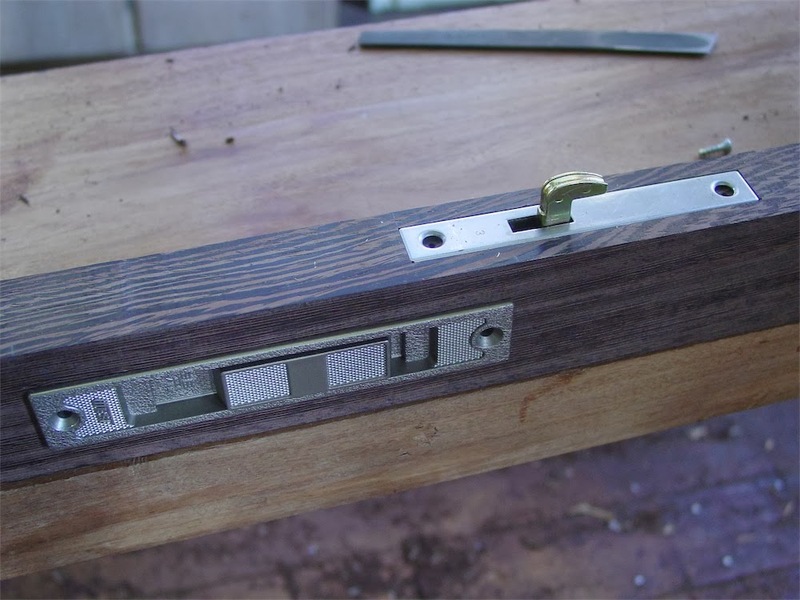 I note that in George Ellis's work “Modern Practical Joinery” (1902), a quad tenon connection is shown in the section on mortise and tenon joints, and is described as for use “in the middle rails of doors that are intended to receive mortise locks”, the mortise lock being fitted between the pairs of tenons. Nice blog good door repairing techniques and even making your door more stronger like it is shown in the pictures how to make your door more stronger by creating exact gaps between two woods and the methods used to fix two parts is to be followed. thanks for your comment. Hopefully the door will be hanging in there for a few more years of service yet. Excellent blog post. Thanks for sharing this interesting post.